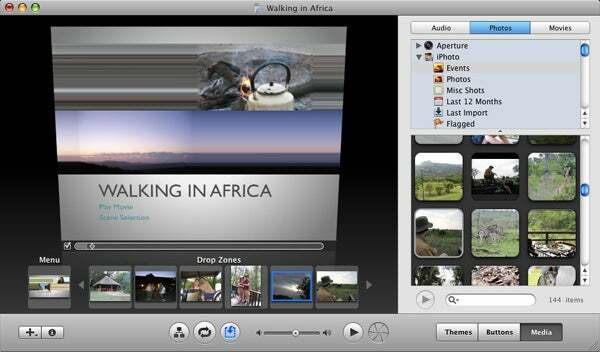 If you watch Apple’s webcast of its August 7 product announcements for news of iDVD ’08, it may take you longer to jump ahead to that point in Steve Jobs’ presentation (the 54-minute mark or so) than the 33 seconds Jobs spends on the DVD-authoring component of iLife ’08 . That gives you a clue to how important DVD creation has become at Apple. So it’s clear that Apple is pushing its revamped .Mac service as the preferred way to share video content, but not everyone has speedy broadband Internet access or is willing to pay $100 for a yearly .Mac subscription. And while iDVD ’08 isn’t nearly as revolutionary as the other iLife ’08 applications, the few changes to the program are welcome. An iDVD release wouldn’t be complete without new themes, and iDVD ’08 delivers 10 of them, each containing professional-looking animation and drop zones where you can add your own photos or movies. As with the previous version, themes can be set to either the standard 4:3 aspect ratio or widescreen 16:9 ratio. The new iDVD ’08 hasn’t changed much from the last version. Some of the enhancements in iDVD ’08 are cleaned-up tools. In iDVD 6, you could edit drop zones by bringing up a floating Drop Zones palette or viewing a drop zone list in the Menu pane. The Menu pane is now gone, replaced by an Edit Drop Zones button that pushes up into the preview area. Speaking of the Menu pane, most of its controls now live on a floating Inspector that changes depending on what’s selected. The Drop Zone Editor is now integrated into the main preview area. 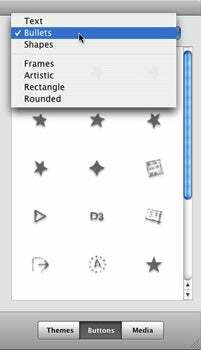 Choose from a large number of styles of displaying and highlighting buttons. Each revision of iDVD has offered a little more control over how a screen appears, and this time the focus appears to be on making it easier. Editing a button’s text label now provides font choices beneath the label instead of on a separate pane; to change more than that (such as the color or alignment), bring up the Inspector. The repertoire of button options has increased, too. A pop-up menu in the Buttons pane now reveals text underlines, bullets, and shapes to be used for highlighted menu objects; that’s also where you’ll find various button styles and frames. As you move buttons around, helpful guide rules appear (as you’d find in Keynote or Pages ). The Quality bar gives you a visual indication of how much capacity can be put onto a disc—in this case, using the High Quality option—before quality begins to suffer. Steve Jobs may have given up on DVDs, but it will be a while before the discs are extinct. Although iDVD ’08 isn’t a great leap over previous versions, it’s a solid upgrade that brings a few welcome refinements. We’ll have a full review at Macworld.com soon.